A bouy in Mass Bay on the day before the race foretells the race. July 18 to 20: Beringer Bowl hosted by Boston Yacht Club. Marblehead to Provincetown overnight race. We entered as a doublehanded boat. No one else did, so we sailed against fully crewed boats. Squalls delayed our start. For the most part, light air and rain prevailed. Averisera finished fourth in class. About half our class dropped out because of light air. The awards dinner was fun. After the race, when there is something to talk about, one meets many new people. We didn't leave early! Next morning ashore for breakfast at the Portuguese Bakery and then off to the Canal. Upwind, of course, in a building breeze. The beautiful evening sky shows the makings of a summer squall. 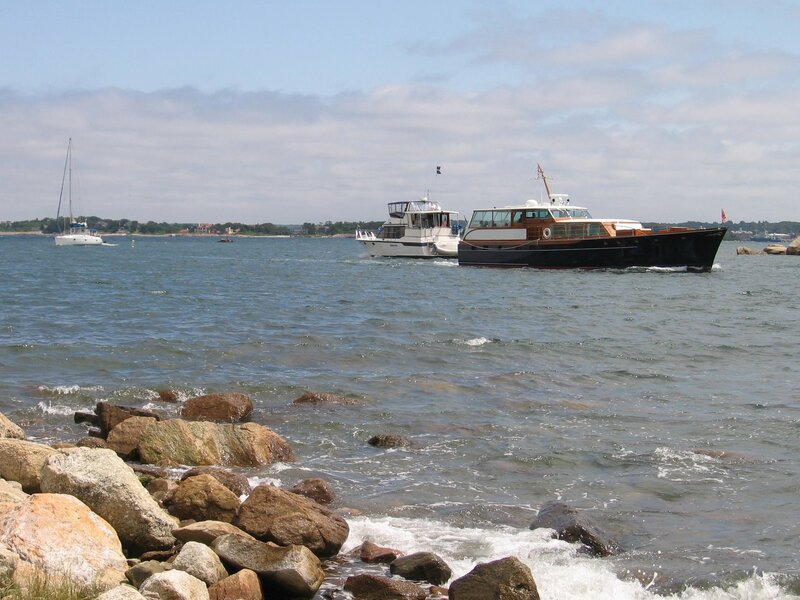 The anchorage is a cross roads, of sorts, for cruisers going to and from the North or South sides of Cape Cod and entering or leaving Nantucket Sound. We climbed around Bull Island, bird watched, and boat watched. Departed the next day for Newport with an intermediate stop in the anchorage off Cutty Hunk. It is not a good anchorage. Poor holding ground and lots of rolling. Newport welcomed us with periods of sun and periods of rain. More rain than clear, as I recall. Aside from trying to clean and dry the boat, we also undertook a Y-valve repair. All done and all's well. The New England Solo Twin race was terrific. We were so busy there are no pictures. The short story is: Light air start in a dying Easterlie. A SW fill and a great beat out the harbor to Block Island, reach along the South side, and a long run in a dying breeze and rolling seas to Buzzards Bay Tower. Then... a long, dreadfully long beat in either very light or light air. High point? Finishing third ahead of the boats slated to finish one-two-three. All finished astern. Team Averisera arrived at the Newport YC tired but not exhausted. We use rest as a tactic. Both of us got a couple hours of down time. It showed up during the final hours with our good boat handling making the difference. The trip home is a story in itself. Newport to Hadley in the worst weather one can have while coastal sailing: lightning, storms, squalls, calms, and an engine problem. We sailed into Red Brook Harbor and anchored in the lee of Bassett Island. The engine had died. High point... mama... in her PJs... swinging the lead line and calling depths as we short tacked in the narrow channel to an anchorage off Bassett Island, Cataumet, MA. Next weekend, August 1 and 2, Norm travelled to Maine with friend Tom Brown to race aboard Wind Rose. We have done the Wooden Boat races for three years aboard the same boat with owner Bruce Allen. Fog and no wind. There seems to be a pattern.